Anyone know exactly what a compression fracture is? My mother was just admitted to the hospital with compression fractures to the L2 and L3 vertebrae. I was in a car accident a few weeks ago & the pain meds had my brain muddled and I didn’t get all of what the doc was saying. Any one know what this is? It’s not an area of my expertise, but I think a compression fracture is caused when a trauma to the base of the spine causes two or more vertebrae to compress, or crush together. 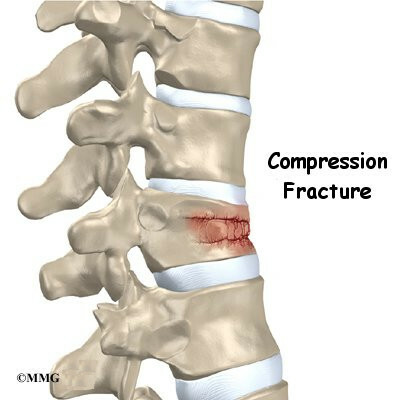 A compression fracture is usually an osteoperotic fracture (loss of bone mineral) caused by either trauma or just being osteoperotic. The vertebrate smushes on itself causing pain and sometimes nerve entrapment. Exactly as above. I have compression # of T11 and T12 vertebrae. They are a smashing together fracture of parts of vertebrae. Mine are broken on the inside of my spinal column. they can be from accidents, osteoporosis, bone cancer. … Or from a weakening caused by radiation treatment. And they can be viciously painful. This is also part of what causes the “dowagers hump” so frequently present in older ladies. I was a caregiver for an elderly lady who had just returned home after being hospitalized with pneumonia. During that time is when they also discovered the compression fractures in her spine. That’s kind of like closing the barn door after the horse has escaped. She was in her 80s and should have had diagnostic bone scans long before this. I don’t know where his head was at. Anyhow, the Rehab Dr. at the hospital did say that it really is painful and can take a really long time to heal. Thank you so much. That’s the first-hand experience I was looking for. You don’t get that from google. That’s what really separates the two sites! Who's at fault for the death of Nodar Khokhobashvili? Is it safe for me to exercise again? Can you imagine what it feels like to indirectly or accidently cause permanent damage to another human being? Should Steven Slater, the former JetBlue flight attendant, serve time for his actions? Why does my back hurt when doing the dishes? How can I alleviate it?